If I remember correctly, this is probably my very first blog post that does not feature a photograph of mine. Guyana has not had many famous photographers, and when I say famous, I mean one whose name is practically a household name locally. On the international scene, we struggle, because we struggle locally to be recognized. One local name that has always been associated with beautiful photography of Guyana’s natural beauty is Robert J. Fernandes (or as he is better known, Bobby Fernandes), his works have appeared in numerous publications, including his own books, and he has had more than a few exhibitions of his photography at the National Art Gallery at Castellani House.. I was doing some prepress work for him for his most recent book, and the photograph he used for the cover took me back to my childhood. It was a photo that I had seen in print at various stages of my life; I cannot remember the first time, but it was likely on a calendar when I was probably in primary school. I attended Saint Stanislaus’ College as my secondary school (Bobby Fernandes’ Alma Mater), and at the school’s office there hung a large print of it. After leaving that institution I don’t recall seeing it for many years, until I attended an event at Moray House and saw a small print on the wall, I instantly recognized it, and pointed it out to Nikhil. 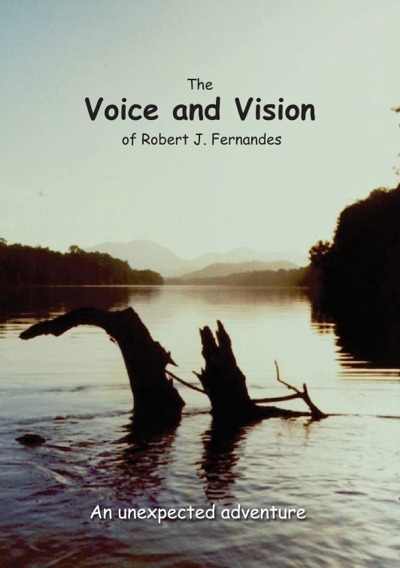 His most recent book is a book of poetry titled “The Voice and Vision of Robert J. Fernandes”, the first section uses many of his photographs that have also inspired poems, among these is the image I refer to with a poem titled “Riverside”. The book is available at Austin’s Book Store, it is a collection of poems that are truly Guyanese, beautifully written by one of our very own. of his Voice and Vision. Today is International Literacy Day; read a book, give a book, and support our local authors. One of the main consequences of the relative poverty of our society is the relegation of the arts (including the ability to consume those arts; literacy) to a very low rank. But I feel that it is when you are down that the arts rescue you from going out. The struggle for economic advancement should be led by the promotion of the arts.